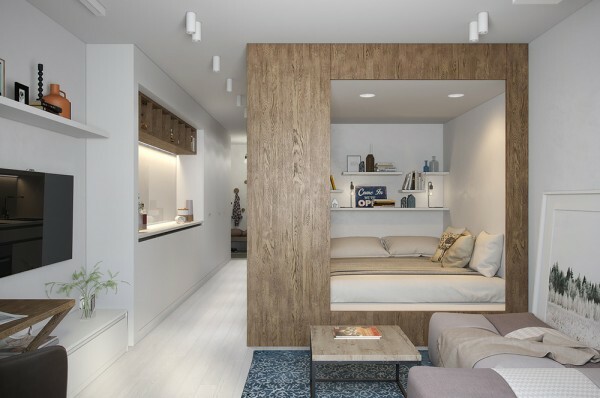 Tiny apartments are among the most interesting homes to use for design inspiration – even if you're working with a larger space, they're a great way to plan compact layout ideas for smaller rooms or even specific-use spaces within a larger area. 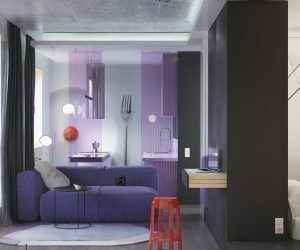 The two apartments featured in the following home tours are both under 30 square meters in size yet make the most of their limited floor plans with creative multipurpose furniture and simple decor. 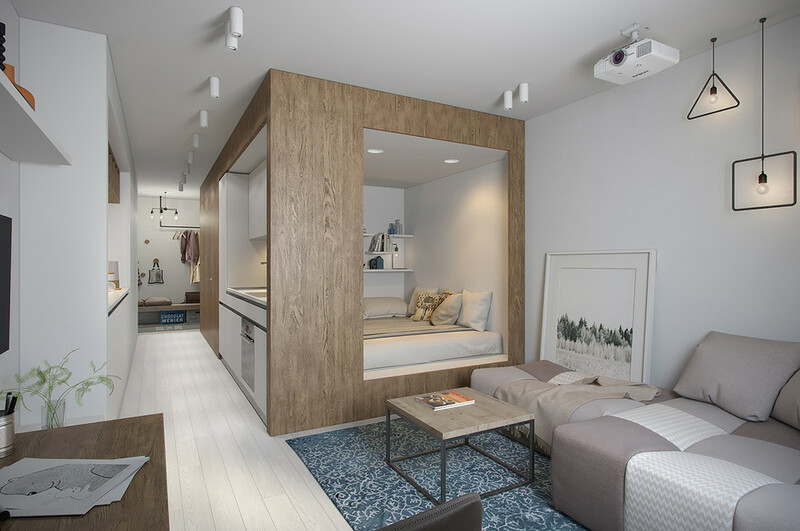 One apartment features a light and bright interior with the other embracing a darker appeal and a lofted layout. Both styles work well in small spaces! 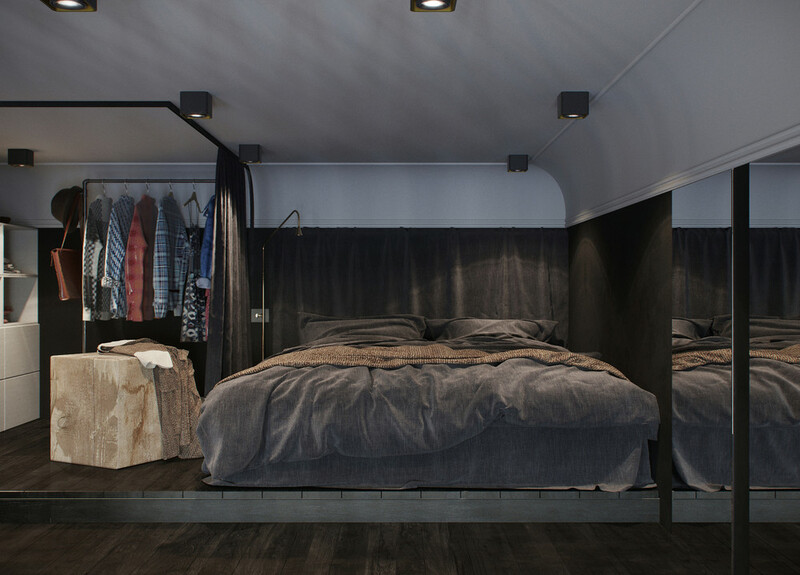 This first apartment occupies a compact studio in St. Petersburg, working with only 29 square meters of floor space. 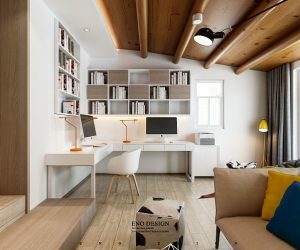 It was designed with a young woman in mind, who desired the freedom of a studio layout with the privacy of a divided home. Clever interior division techniques separate the floor plan into distinct living, kitchen, and bedroom areas without compromising the sense of openness. 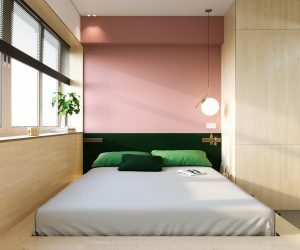 The bedroom occupies a central volume clad with wood veneer, a natural focal point in the middle of an all-white interior. The only colorful accents include a cerulean blue rug and a few terracotta accents. Soft low-slung furniture doesn’t take up too much visual real estate. 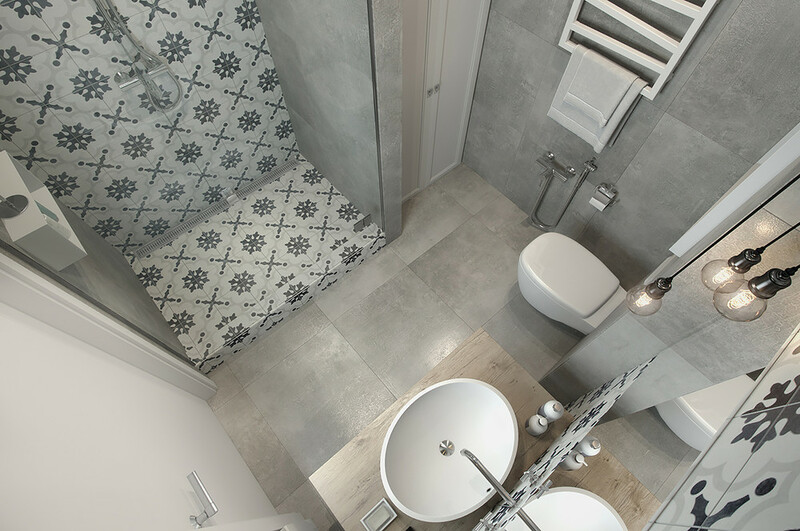 As an aside, those fabulous geometric pendants in the far left corner are from the Geometry Made Easy collection. 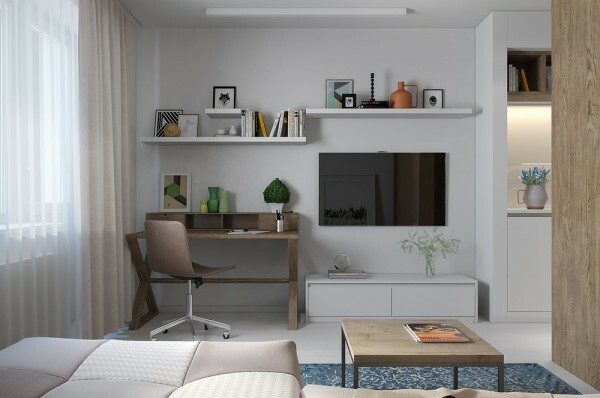 A neat and tidy office takes its place right next to the television. Open shelving houses useful books, and offers a convenient way to display artwork without using screws or nails. 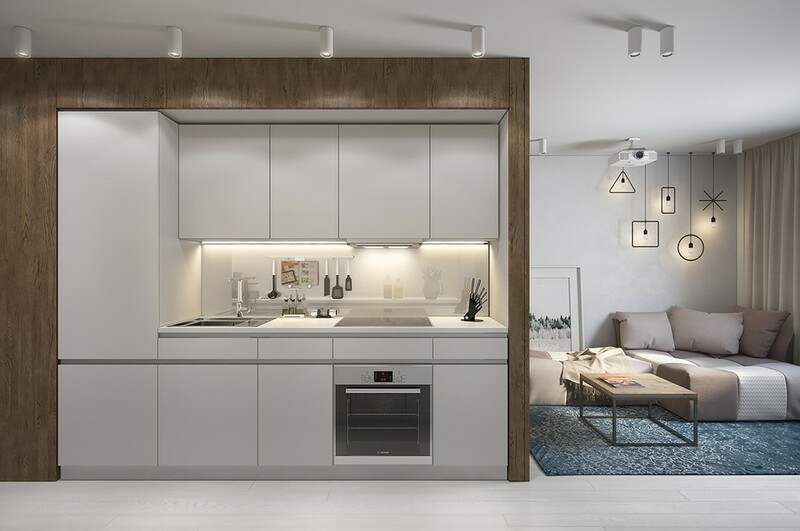 The kitchen itself is extremely minimalistic and smooth, its bright white treatments and ample integrated lighting working to counteract its interior windowless placement. 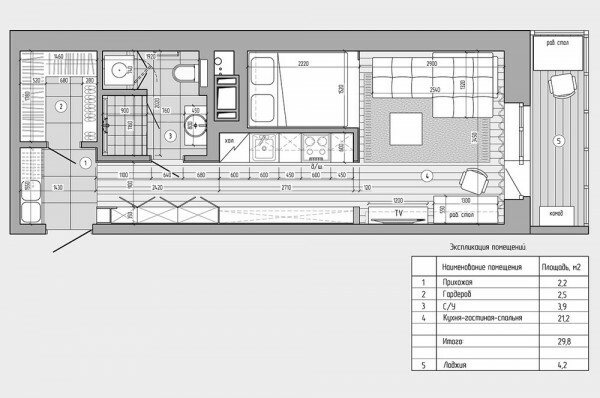 Strong grey lines within the drawer pull recesses help guide the eye along both sides of the galley layout. A view from the entryway at the end of the kitchen: here, the hallway transitions to a split material composition, with wood on one side and white cabinetry on the other. 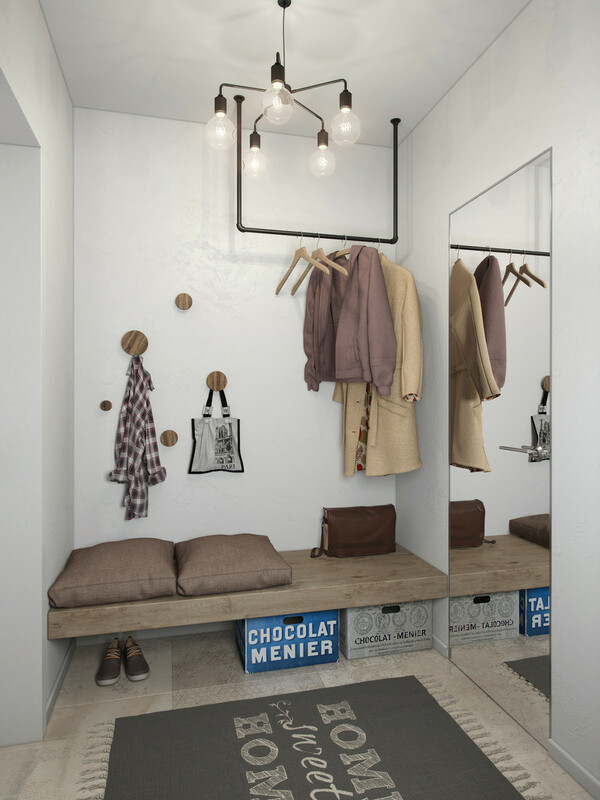 The gorgeous entryway hosts every feature necessary to welcome guests comfortably, including a sitting bench with space for shoes and storage beneath, and cute round-peg coat hangers. The bathroom doesn’t have a particularly spacious floor plan either. 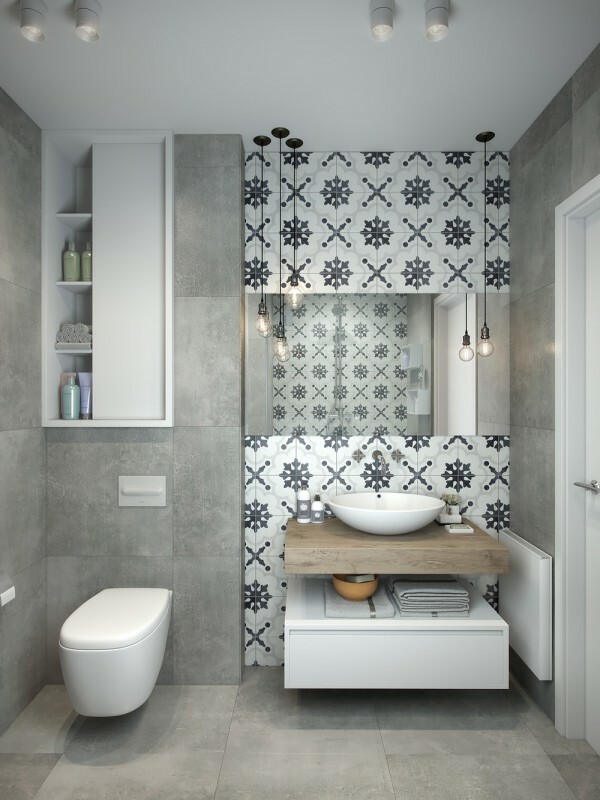 It’s simple materials for the primary surfaces allow plenty of room to explore bold tile patterns. Edison-inspired bulbs provide gentle task lighting and decorative effect in addition to the ceiling-mounted lights above. 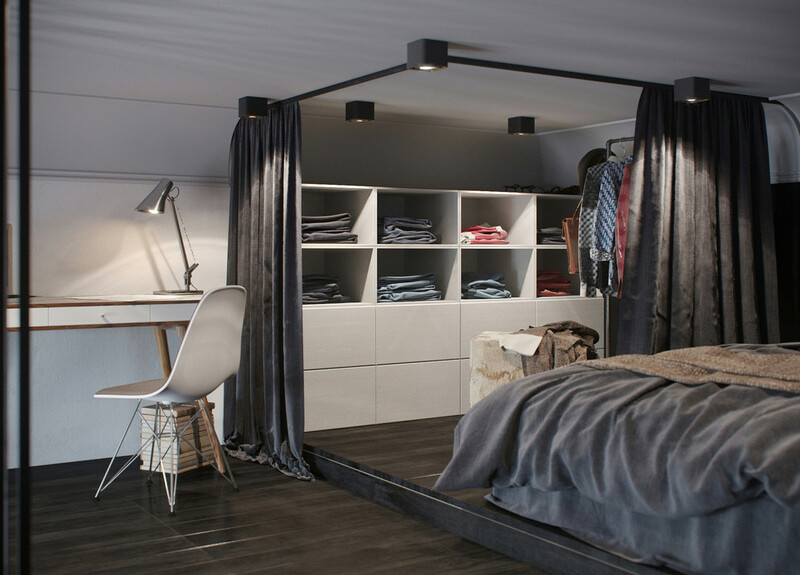 Simple storage solutions include an open shelf above a cantilever drawer, all tucked neatly beneath the vanity. 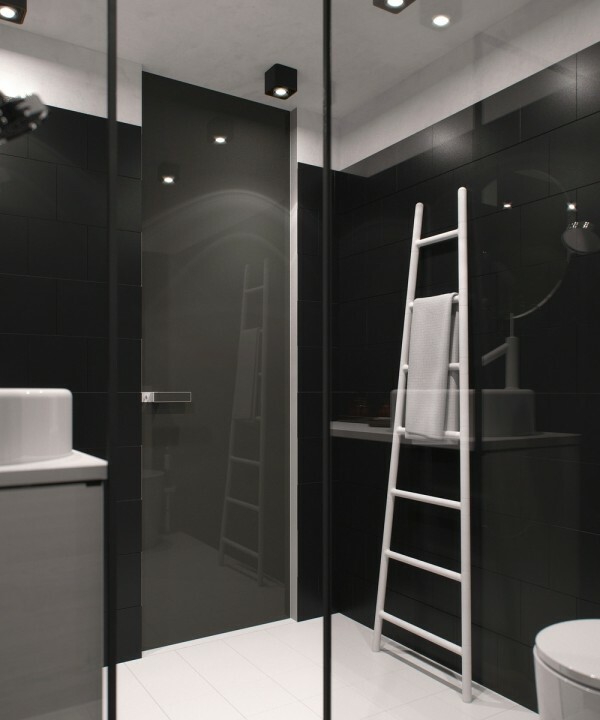 More shelves occupy the space above the toilet easily hidden by a sliding door. Working with less than 24 square meters, this apartment design takes advantage of tall ceilings to expand the living space vertically rather than horizontally. 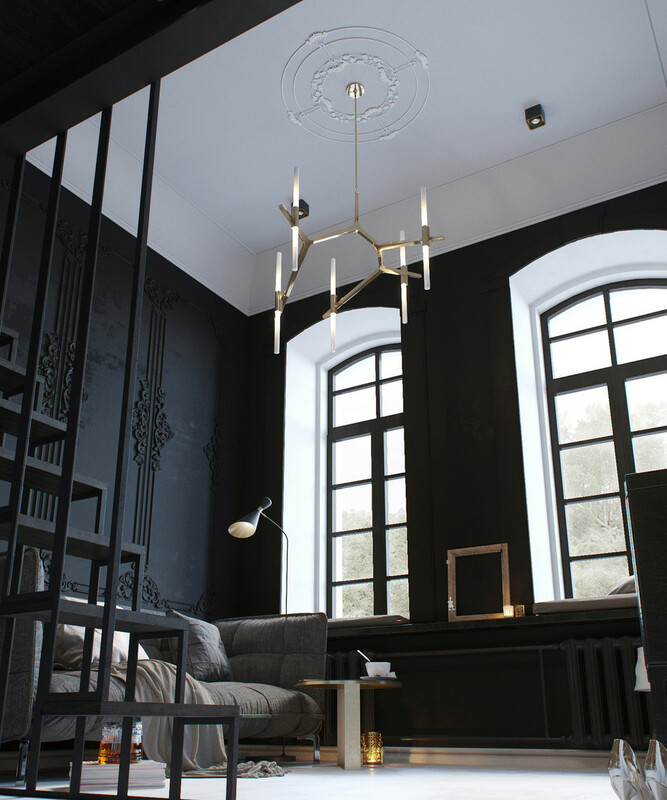 It was designed with a young woman in mind and enjoys comfortable dark styling for an intimate and elegant atmosphere. 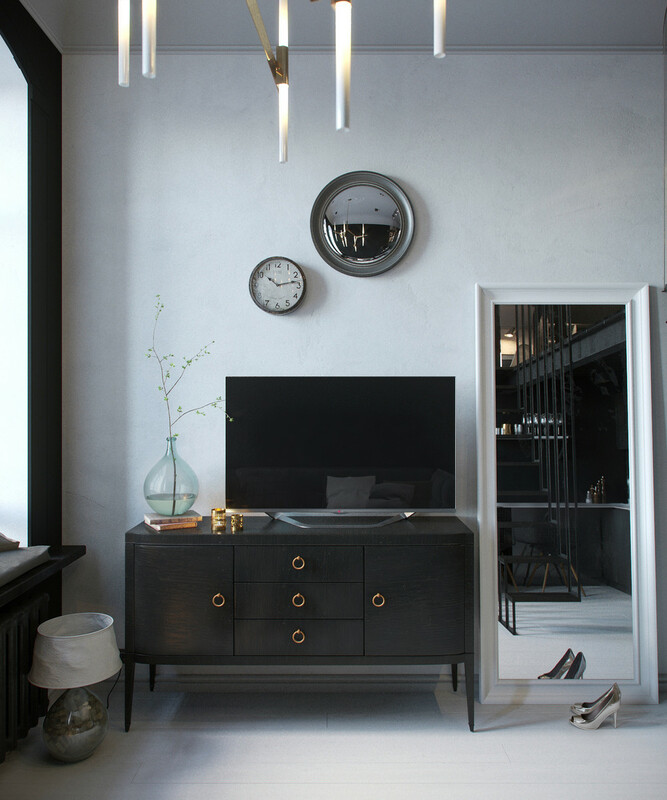 Gorgeous copper, brass, and silver accents can be found throughout the home. Ample mirrors complement their polished metallic appeal. 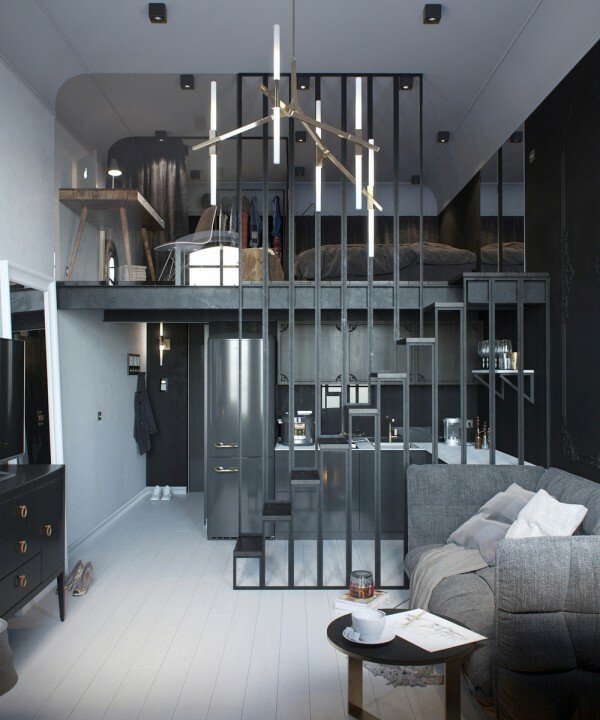 Its elegance is not diminished by the loft-style layout. Rather, even the basic utilitarian elements help further the design. Here, stairs double as an implied divider between the living room and kitchen. 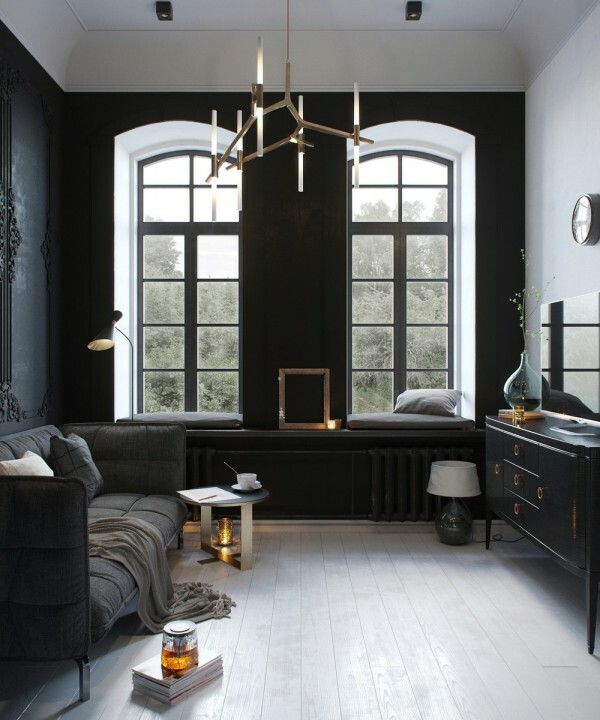 Of course, in such a dark apartment, it’s important to use natural lighting in a creative way. Light floors and bright white window alcoves use contrast to their advantage. The effect is dramatic! 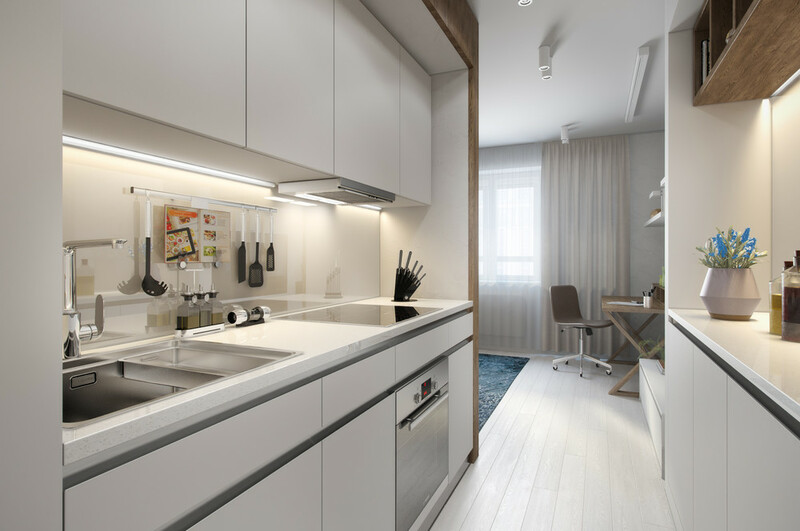 Half-cantilever construction, supported on only one side, leaves more room beneath the staircase to maximize the kitchen floor plan. 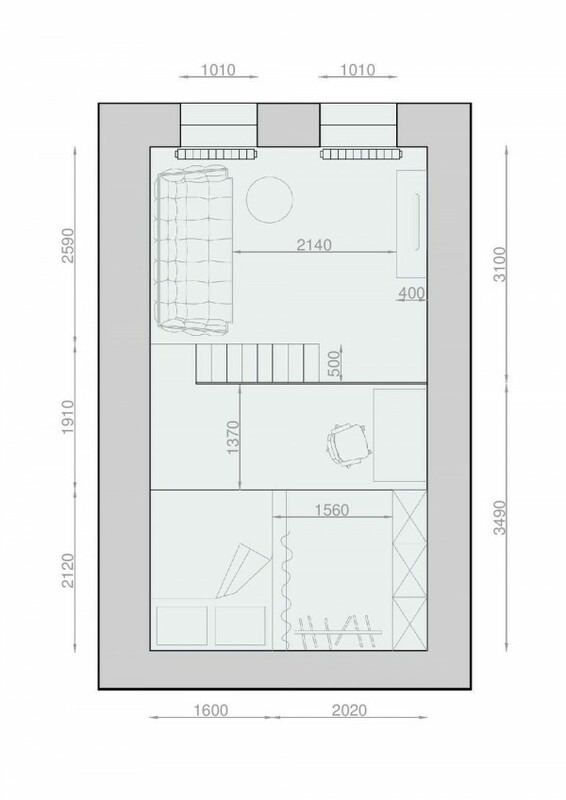 Every foot matters in an apartment this compact. In the loft space above, a small office area enjoys a fantastic view out the windows in the living room below. 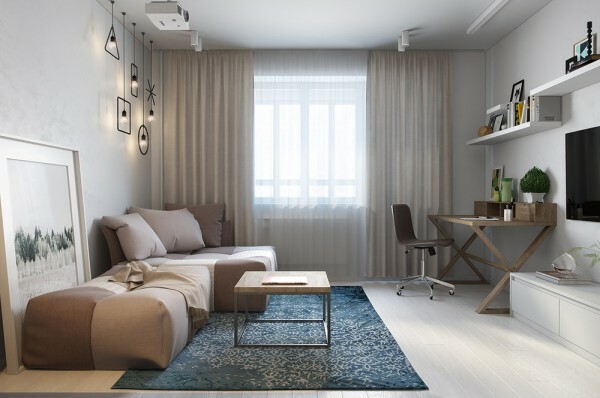 A rounded edge where the wall meets the ceiling eliminates shadows for a more spacious appearance. 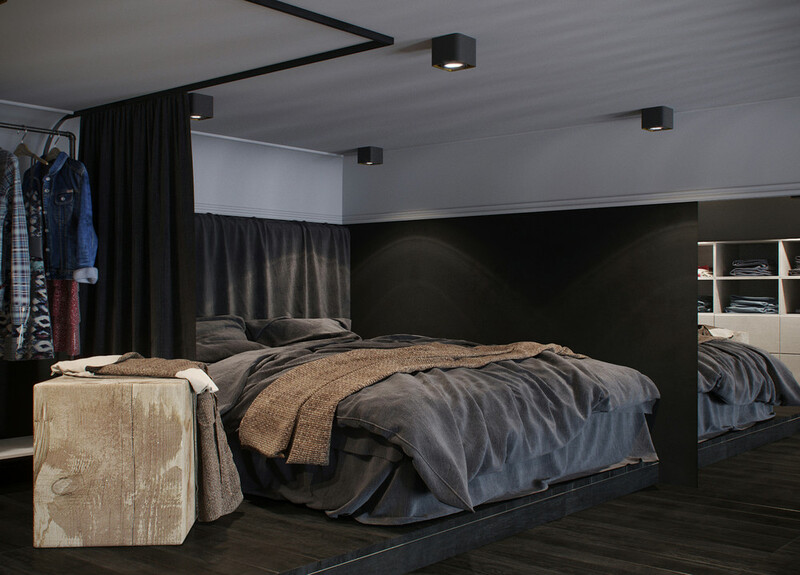 The bedroom, directly next to the office area, uses dark tones and textural fabrics to weave a subdued dark vibe – a very relaxing result. A small mirror to the right makes the space look larger. 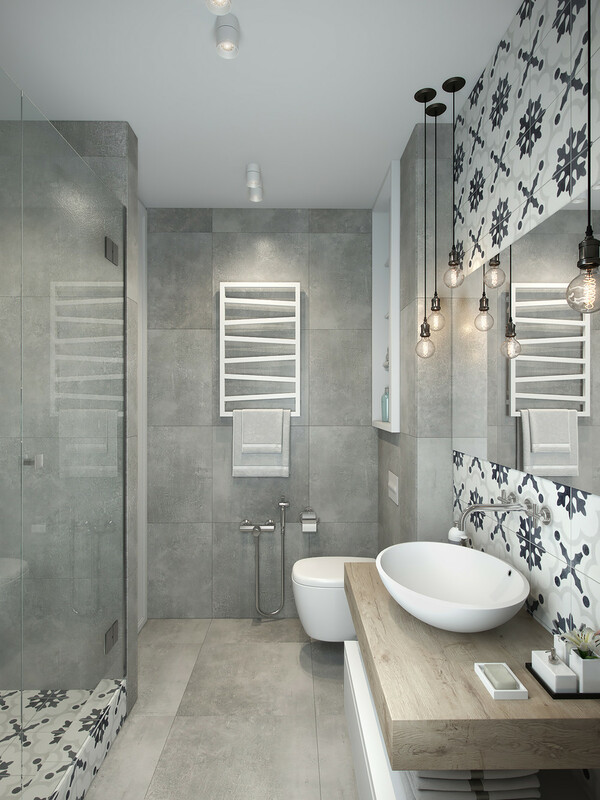 Natural tones accent the upstairs, in contrast to the metallic accents used below. A brown blanket and a side table made from a solid block of wood add just a touch of natural appeal. 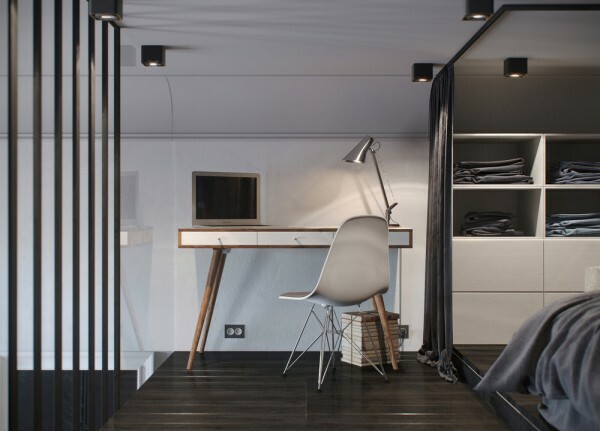 Despite its secluded location in the loft, the wardrobe area takes advantage of luxurious curtains to reduce the amount of visual clutter when guests stop by, and aid concentration when studying at the nearby desk. 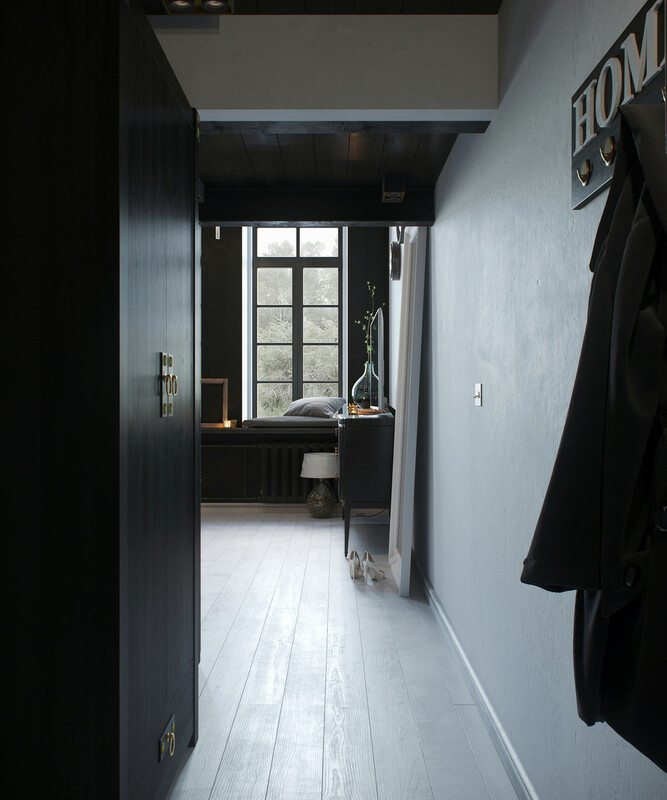 Back down below, even the entryway takes a tastefully luxurious approach. 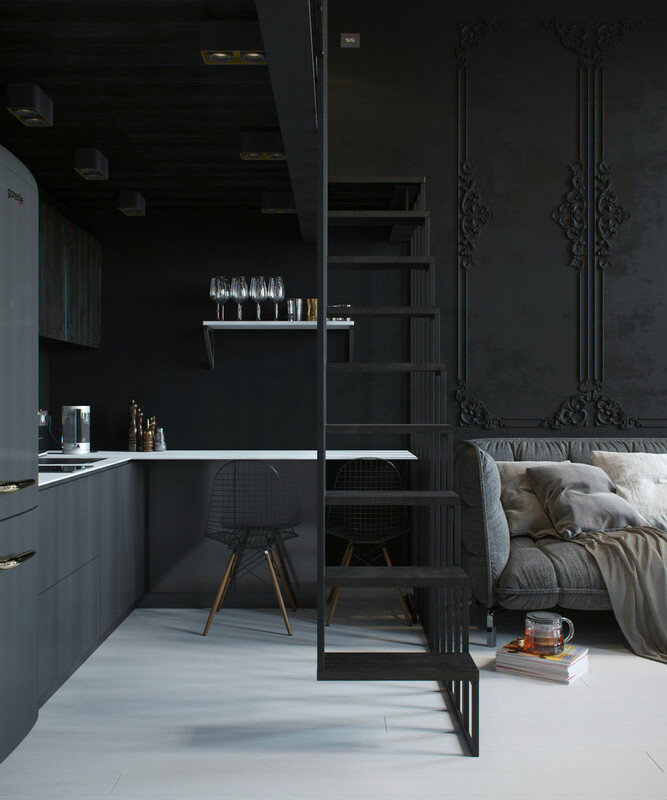 A glossy door and distressed matte surfaces create an eye-catching contrast. 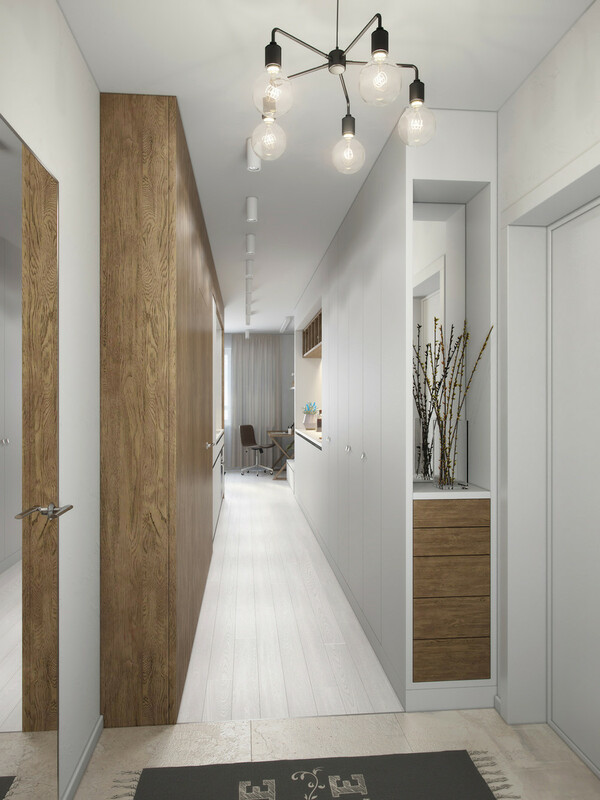 Like the rest of the apartment, white wood floors emphasize the natural light where needed. Here, it brightens the way toward the living room. 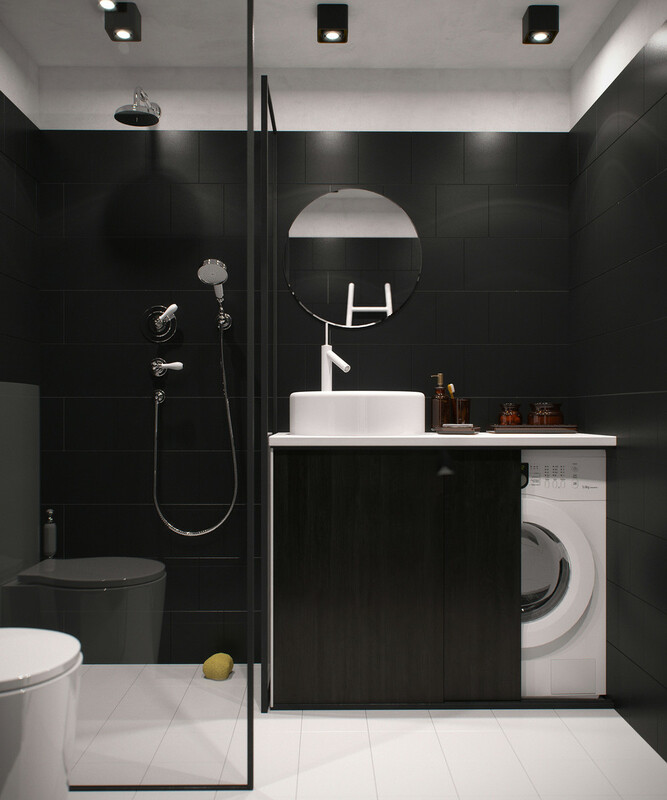 Compact bathroom design integrates all the necessary features within a small footprint, even including laundry appliances easily hidden by sliding doors. Following the trend set by the public apartment spaces, this bathroom enjoys the moody atmosphere of dark walls but doesn’t feel too gloomy thanks to a bright white floor and ceiling. 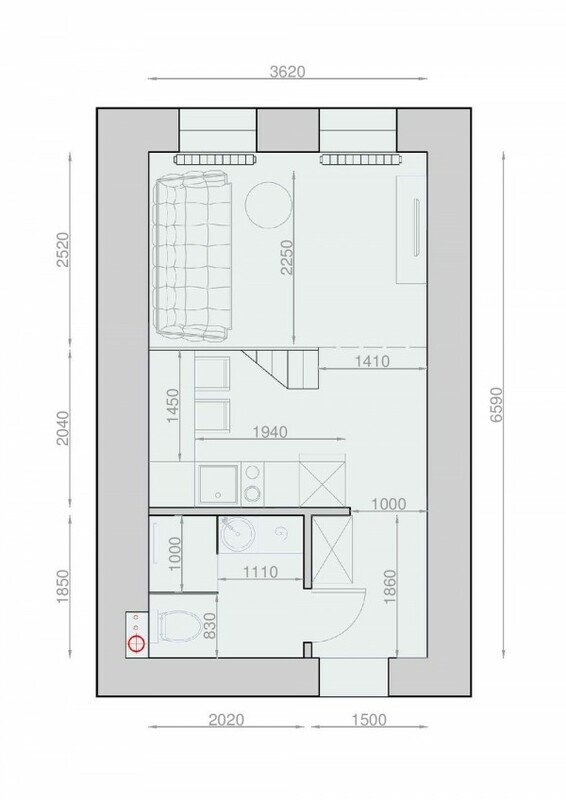 But unlike the main living volume, decoration is subdued in favor of streamlined forms. 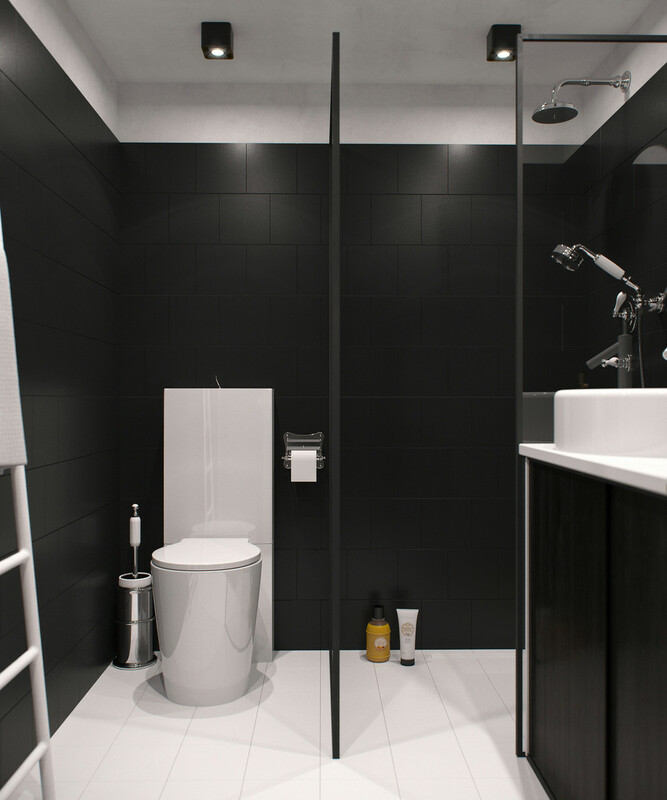 Clean lines are favored over complicated or decorative shapes, and there’s no ornamental paneling in sight. 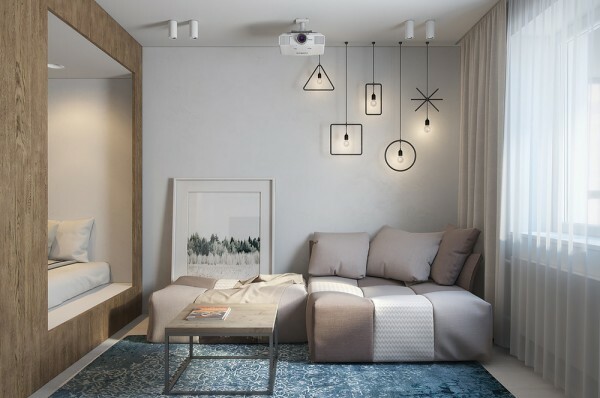 Although it lacks direct decoration, geometric themes do provide visual interest. 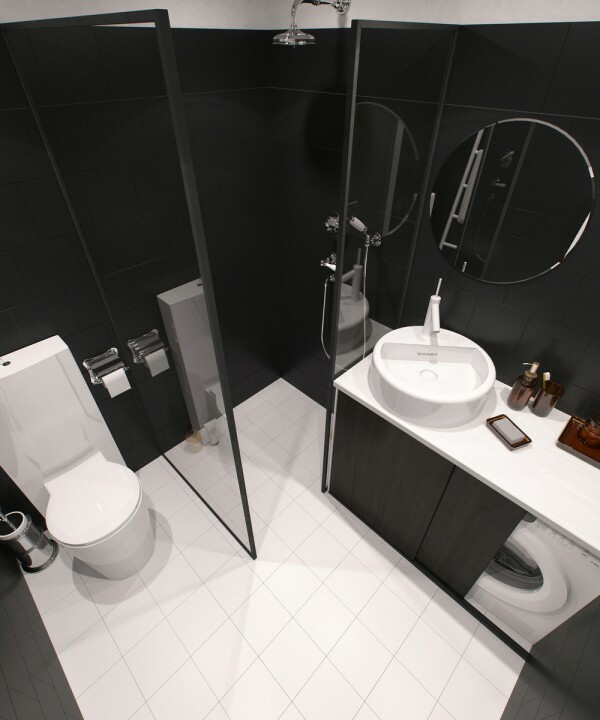 Straightforward grids contrast with the rounded shapes of the plumbing fixtures.